Four hours north of Phoenix, AZ lies lovely Page. coined the “Center of Canyon Country”. Page sits atop Manson Mesa overlooking 186 miles of Lake Powell, the dramatic Glen Canyon Dam, arches and historical native ruins. Both a destination to “stay awhile” and a crossroads point for treks to Monument Valley and other Utah National Parks, Page caters to car camping and won’t disappoint in the slightest. Caused from the damming of the Colorado River, Lake Powell is nestled on the Arizona/Utah border. 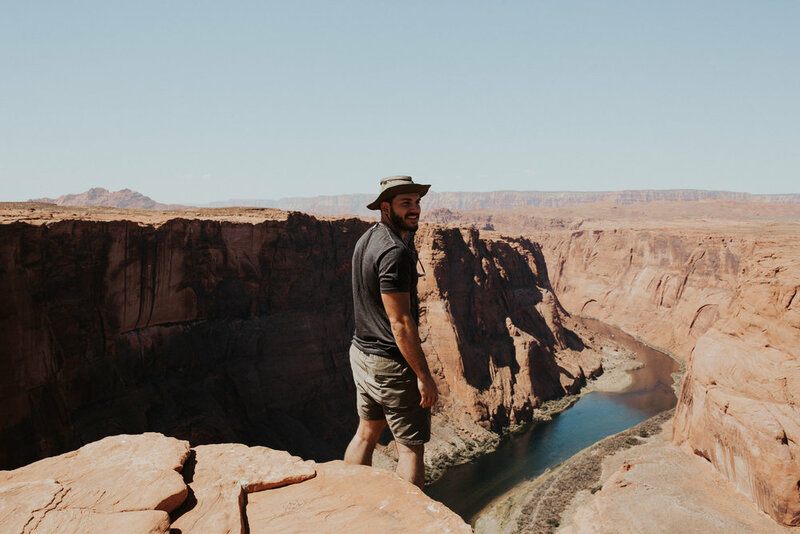 One of the most scenic lakes in the world, Lake Powell is a perfect place to car camp - with it’s expanse territory, flat beaches and epic sunsets - you can’t go wrong Boho’ing it up here. There are many sites to choose from but Lone Rock Beach is our current favorite. For a cheap $10 you’re in - and both bathrooms and showers are available for use (no reservations needed). To kick it up a notch, head to Wahweap Marina to for a sunset dinner cruise or grab a bite to eat at the marina restaurant. The most photographed slot canyon in the USA includes two separate tours that are accessible by guided tour only. There are two tours to choose from - upper and lower antelope canyon (we prefer lower just by a hair). Make reservations in advance and bring a camera! We trust Ken’s Tours so use them to book! Tip: Try to visit during the middle of the day to view the magnificent sunbeams dance inside. Another must-see on the Arizona side of Page - this horseshoe-shaped canyon showcases breath-taking views of the Colorado River. A 20 minute hike up a mild incline from the parking lot will take you to the viewpoint. The best part? It’s FREE! We recommend sunrise or sunset for this experience. Directions found here.